Although their specific design varies from book to book, flaps are typically defined as the parts of a page Page one side of a leaf. See: Recto Leaf Verso Paginae PDF CLOSE or ESC used to conceal text, illustration, or a combination of both. 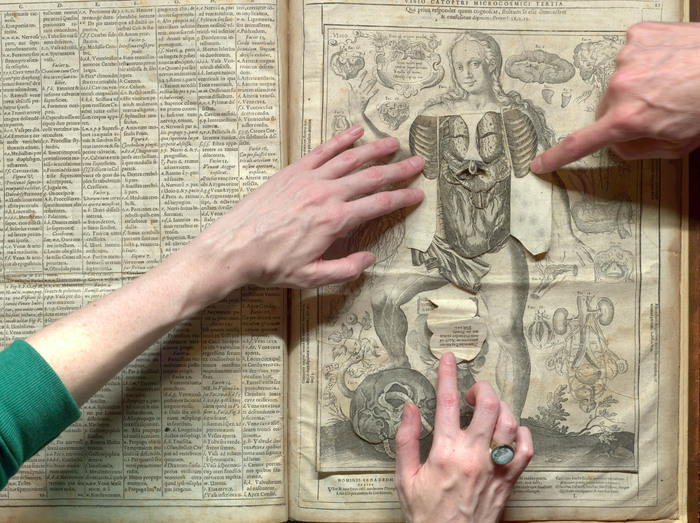 The fugitive sheets or fugitive leaves found in some early anatomy texts, for example, are generally comprised of separate pieces of paper that are pasted and arranged to depict various layers of viscera. 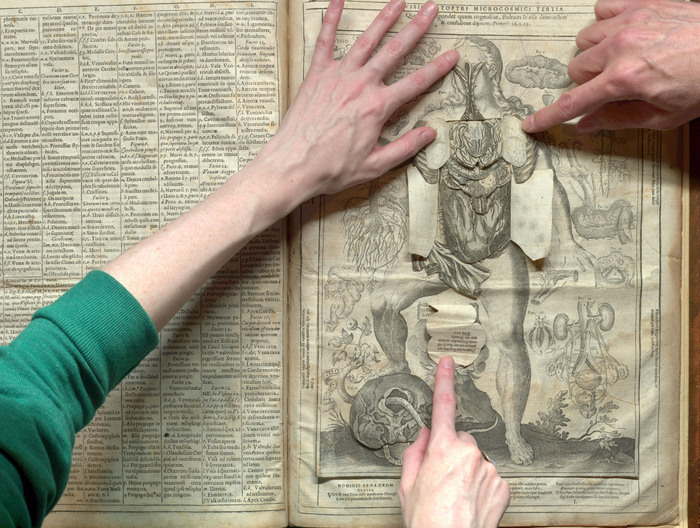 Readers of such books lift or separate these flaps to reveal the interior anatomy of the human body.1 Flaps found in early children’s literature, on the other hand, are often single sheets of paper folded vertically along the top and bottom with vertical slits cut into both sides to create four separate sections;2 readers simply lift each flap to reveal the next part of the story. While the exact construction of each flap may differ from one text to another, their function remains basically the same: flaps are designed to reveal things that are not immediately apparent on the page itself. While some flaps are designed to conceal information, and thus compel the reader to reveal the text or illustrations beneath, other flaps organize information into logical layers. Early anatomy texts, including the famous examples by Vesalius, Descartes, and Remmelin, depict body parts, bones, muscles, nerves, and internal organs using superimposed flaps that are drawn and shaped to represent specific elements of human anatomy. 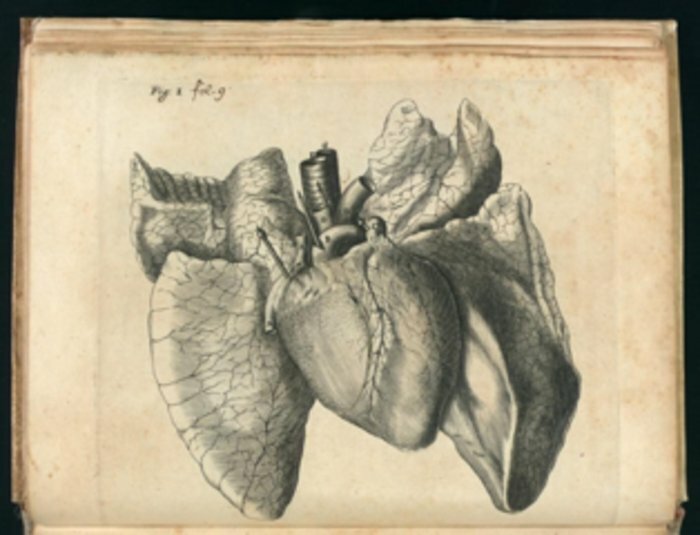 Some of these flaps, in particular Descartes’s image of a human heart and Remmelin’s rendition of a pregnant womb, are meticulously rendered. The reader is thus given the tactile experience of grasping the organ itself. Flaps are often discussed in connection with other movable parts found in books. This is due partly to the fact that they emerged roughly in the same period as volvelles Volvelle consists of one or more layers of parchment or paper discs or other segments fastened to a leaf, allowing for each individual layer to be rotated independently of the other components. See the ArchBook essay Volvelles for more details. CLOSE or ESC and pop-ups Pop-up term often used to describe a three-dimensional paper construction found in books. Also used as a generic marker for books containing such constructions, i.e., "pop-up books." See: Paper CLOSE or ESC. In the sixteenth and seventeenth centuries, books with moveable parts were primarily academic in nature; by the eighteenth century, publishers expanded their reach to the burgeoning children’s entertainment market.3 This entry will consider examples of books produced between 1543 and 1907 from a wide range of genres, including geometry and anatomy textbooks, landscaping treatises, and children’s literature. Flaps are ideal for explaining subjects that require three-dimensional imagery. Abstract concepts, such as geometrical shapes, can therefore be better experienced through the use of flaps. 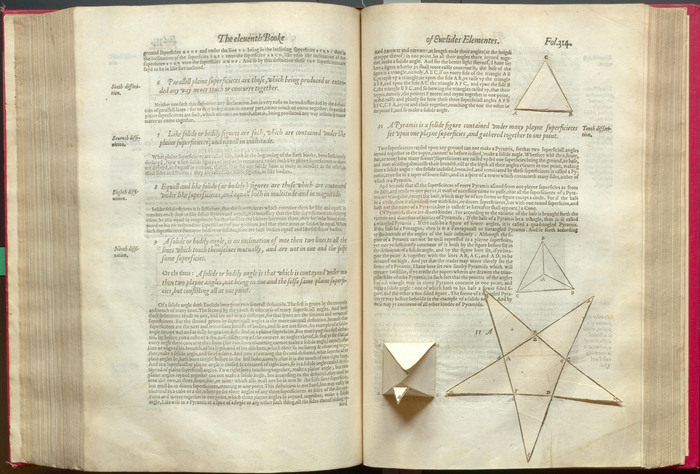 Henry Billingsley’s English translation of Euclid’s The Elements of Geometrie is an early example of a book containing pop-ups.4 First printed in English by John Day, the publication of The Elements of Geometrie (London, 1570) was delayed, in large part, because of the technical demands required to produce its numerous complex figures.5 Unlike other editions of Euclid, which only use two-dimensional sketches to explain mathematical concepts, thirty-two of the figures found in Day’s imprint are pop-up constructions: two-dimensional diagrams of pyramids and cubes are printed on flaps that the reader folds together to create three-dimensional renderings.6 The flaps used in Elements thus play a vital role in allowing readers to tangibly understand solid geometry (see fig. 1). The flaps in Euclid’s Elements are cut to lie flat, allowing the book to close naturally. Elements thus offers the reader the unique opportunity to view the same shape in two different states—collapsed and fully-formed—without damaging any of the essential components. This use of a simple flap technology to create three-dimensional shapes contributes much to the experience of visualizing difficult mathematical concepts. In this particular example, the interest is not in what lies beneath the flap, but in what can be created through manipulation of it, and in what can be learned about each shape when it is built up and when it is lying flat. The Elements of Geometrie illustrates the potential inherent in three-dimensional description, while also retaining each shape’s two-dimensional counterpart. Through viewing the shape in both states, the reader can better comprehend the larger patterns and principles of geometry. Various changes were made to each subsequent edition of Fabrica, the most striking of which occurred in the second unauthorized edition of 1552 titled De humani corporis fabrica, lib. VII. At the time of Fabrica’s publication, the French city of Lyon was a hotbed for piracy of popular sixteenth-century books; while the lib. VII is but one of many pirated works published in Lyon, it is a particularly interesting and rare edition.16 Scholar-printer Jean de Tournes tried to capitalize on the widespread success of Fabrica by creating an unauthorized two-volume pocket edition aimed at the student market.17 The changes made to the work are drastic; the image quality is significantly reduced, while all of the flaps and the majority of the drawings have been omitted. Ironically, while de Tournes had hoped to promote his pirated Fabrica to students, the liberties he took with the text destroyed Fabrica’s most useful pedagogical attributes. 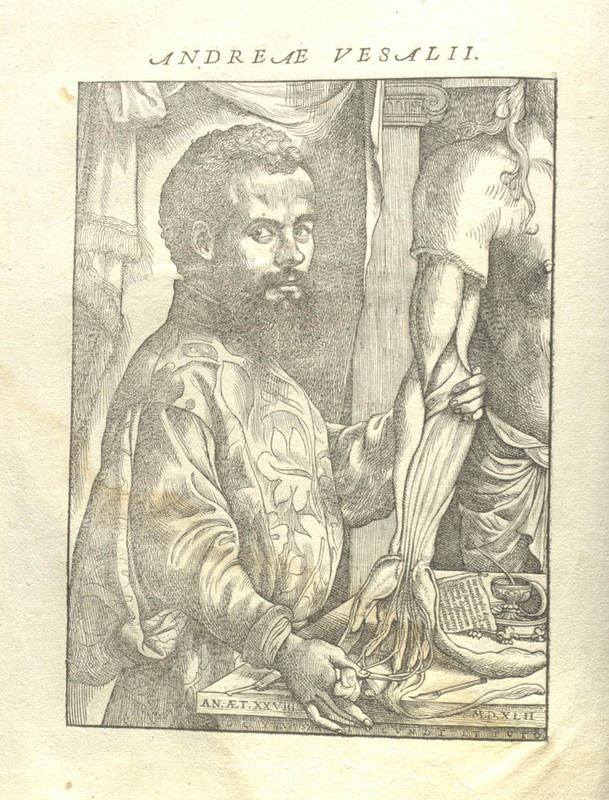 Like Vesalius, Remmelin used flaps to reveal human anatomy layer by layer, and his flap designs, rendered in both editions by Lucas Kilian, were based on his own drawings (see fig. 4).21 The title of Remmelin’s work translates roughly to mean “microscopic mirror,” or “man as microcosm,”22 thus suggesting a metaphysical, rather than simply physiological, dimension behind Remmelin’s approach to anatomy. The drawings testify to this fact, as they are strikingly allegorical. One plate depicts a woman and man on either side of a pregnant female torso, while two others depict a man and a woman respectively, each enhanced by distinctly allegorical imagery. 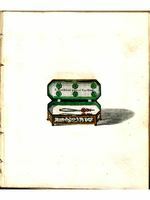 While in some ways Remmelin’s Catoptrum microcosmicum is more aesthetically impressive than Vesalius’s Fabrica, particularly because of its sophisticated use of multi-layered flaps, Remmelin’s folio edition was impractical as a teaching tool,23 and therefore does not share the same level of historical significance. 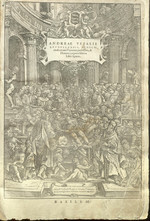 The sheer size of the book, the delicacy of its flaps, and the cost of purchasing such a magnificent volume prevented the book from being widely used in classrooms;24 however, the 1613 sheets were used in some anatomy theatres including Leiden University.25 Furthermore, by the time the Catoptrum microcosmicum was published, anatomy had shifted away from its former allegorical roots. 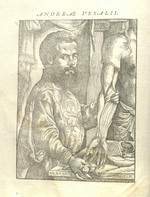 However, for this very reason Remmelin’s work makes for an interesting anomaly among anatomical works of this period: while visually sophisticated, the work also reverts to a more allegorical conception of the human body, thus placing the work between two different philosophies (science and mythology), and two different understandings of anatomy (pre- and post-Vesalian). This hybridity in Remmelin’s work can be seen in an image where a male figure is shown leaning on an apple that is crushing a snake. The biblical allegory here is obvious, but lifting the flap reveals that the apple conceals a human brain. The female character seen in figures 5 and 6 is shown in a similar position, but the snake, alive and well, has now eaten its way through the apple/brain positioned by the woman’s foot. While depicting the human body in the tradition of Vesalius, Remmelin’s work also incorporates earlier, mythical conceptions of anatomy. 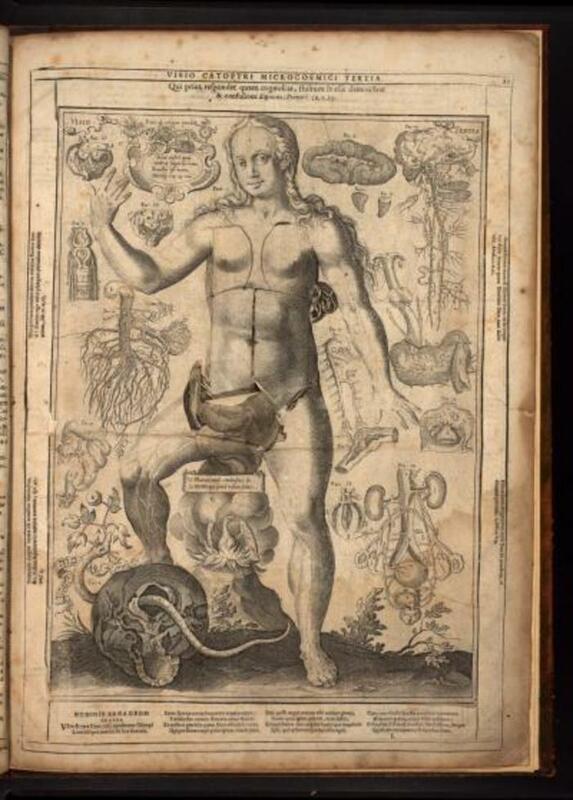 René Descartes’s De Homine Figuris (“The Treatise of Man”) is another important anatomical work containing flaps. 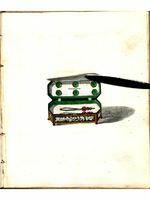 Often considered the ﬁrst European book on physiology, the work was published in 1662, twelve years after Descartes’s death.26 Fearing that the work would result in accusations of heresy, Descartes deliberately prevented its publication during his lifetime.27 De Homine Figuris is famous for its conception of “man as a machine created by God,” and its suggestion that the brain directs the soul; it is also the first work to make reference to involuntary reflex action.28 The work thus marks an important contribution to medical science. The use of flaps in anatomy textbooks demonstrates how a physical feature of the book can be used to represent subsurface information, and how such images (representative of viscera and layers of the human anatomy) might be designed in relation to each other. Without actually appearing in three dimensions, these works still grant the reader the opportunity to move deeper and deeper into the body and its organs. The placement of these flaps, then, is just as important as what the flaps depict or disguise. Complex and delicate flaps such as those used in the Euclid, Vesalius, Remmelin, and Descartes texts are not without technical and practical complications. The flaps demand touch and manipulation, which increases the likelihood of tearing or disintegration; when even a single layer is torn from a scientific text, the intent and effect of the image can be dramatically compromised. The possibility of damage is aggravated by the very format of the codex, the pages of which are pressed together when closed. If a reader neglects to position the flaps carefully before closing the codex, the flaps may fold or twist irreparably. Harlequinade turn-ups exemplify transitional media.41 Like all books containing flaps, Harlequinade turn-ups are designed with interactive readers in mind. While the level of participation is entirely conditional on a reader’s willingness to interact, the meaning enclosed beneath the turn-ups is only fully realized when a reader participates. The participatory aspect of Harlequinade turn-ups also extends to the performances by which they were inspired. The demanding voice of the narrator, who orders readers to “Turn it up and you may view...” or “Turn down, you’ll find the ready way,”42 asserts its dominance over the story. Shunned by the more refined sectors of British society, pantomimes were a raucously participatory experience for both the actors, who collaborated without a published script, and the audience members, who were encouraged to give critical feedback to the performers and behave as active participants.43 In this sense, viewers were given control over the details, though not the eventual outcome of the story, which is similar to how readers interact with the flaps found in turn-up books. 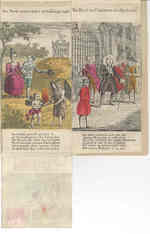 In the 1820s there emerged yet another type of flap book with a physical structure similar to that of Descartes’s De Homine, in which a flap, cut from the main page, lifts to reveal the image pasted beneath. While devising a party favour, painter William Grimaldi noticed the wide assortment of items collected on his daughter’s dressing table.44 The collection would inspire Grimaldi to produce his work The Toilet. In this work, Grimaldi sketched each individual item on the upward-facing part of the flap, along with the name of a corresponding virtue beneath. The image of a container of Rouge Superieur opens to reveal the word “Modesty”;45 the example shown below (see figs. 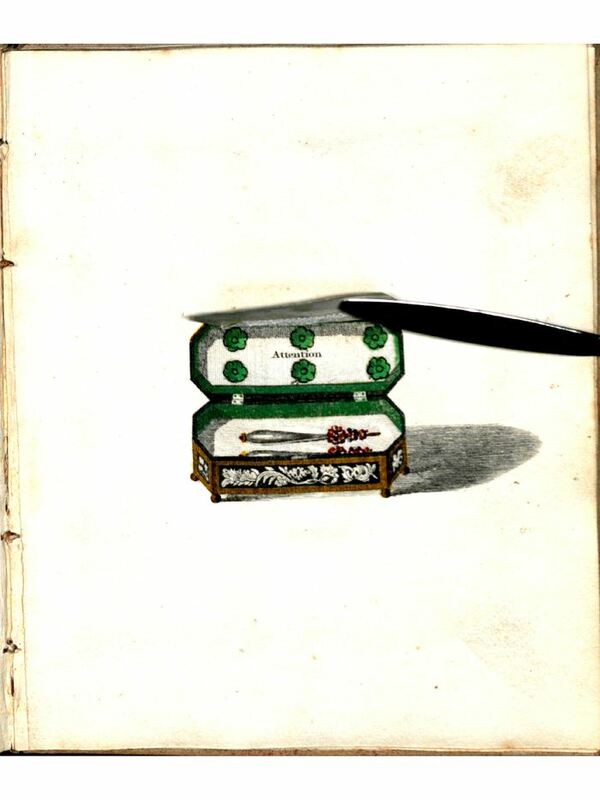 10-11) depicts a jewelry box with an opening to the word “Attention.” That these small books became such popular party favours despite the stern reminders hidden beneath each feminine trinket is a testament to the sensibilities of the time; clearly moral virtue was held in very high esteem if an acceptable party game could be based wholly on the rebuke of objects that risked violating carefully guarded values. Grimaldi’s The Toilet, published by his son Stacey, became very popular, and spawned various imitations. Most notable among these was Indispensible Requisites for Dandies of Both Sexes, written by an unnamed Irish woman known only as “A Lady”:46 in her work readers see flaps with captions, but when they lift the flaps they find double entendres relating to those captions. For example, a caption reading “Oriental Head Dress” appears above a flap image of a woman wearing an elaborate hat; upon lifting the flap, the reader finds the words “Sobriety of mind.” Grimaldi’s son Stacey, acting as publisher and co-author, urged Grimaldi toward his eventual follow-up: A Suit of Armour for Youth. While following the same structure and principle as his previous work, but nesting moralizing aphorisms beneath pieces of armour, Suit of Armour proved far less successful. These and other examples of "Toilet Books" characterize the intersection between entertainment and the dissemination of popular morality. The flaps make this duality all the more interesting because the reader cannot see or absorb these moral teachings without willingly lifting each flap. The placement of the text beneath the flap allows the reader to form his or her own interpretation of the surface image, even though the underlying, fixed meaning is uninfluenced by reader opinion. The moral pronouncements are permanent; whether the reader is willing to accept them is less certain. Flaps represent an early interactive interface. By creating a deeper level of visual and tactile understanding for the reader, flaps further enhance a book’s educational and entertainment value. The existence of flaps and other movable parts in centuries-old books reminds us that reader interaction is not a new phenomenon, and that an interactive component, or an interface, has been a part of books long before the invention of digital media. The well-established connection between seeing and understanding has long influenced how we communicate, teach, and present information; by drawing on the relationships between the visual, the cognitive, and the tactile, flaps exemplify interactive and multifaceted learning tools, and remind us of the continuing challenge to communicate not only through words, but also through images and reader interaction. In the digital environment flaps also permit such reader interaction, although the physical contact between reader and page is replaced by a click of the mouse or a touch-screen; further, the digitization of flaps would eliminate the potential for loss or physical damage. The digital environment is more dynamic than print, and motion is both more easily accomplished and less traumatic for the page. However, the digital interface also acts as a mediator where previously none existed; technical incompatibilities such as the reader’s chosen operating system or limited bandwidth for online materials may prohibit their use of the book’s movable components.49 A reader’s experience with a print volume is, of course, free from such complications; however, while technical incompatibilities can often be adjusted, a ruined print book is less salvageable. Though digital environments have drastically redefined the power and potential of text, the idea of movement, user interaction, and pushing the boundaries of an otherwise static page has a long and varied history that is well worth examining and learning from. Flaps are but one part of that important history. 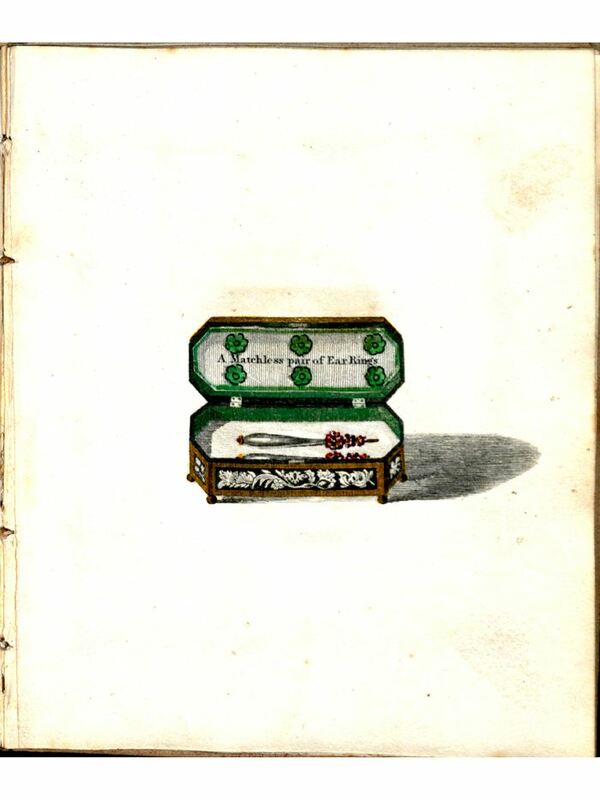 "Johann Remmelin's Catoptrum Microcosmicum." Hardin Library. Accessed March 18, 2011. http://sdrc.lib.uiowa.edu/exhibits/imaging/remmelin/about.htm. 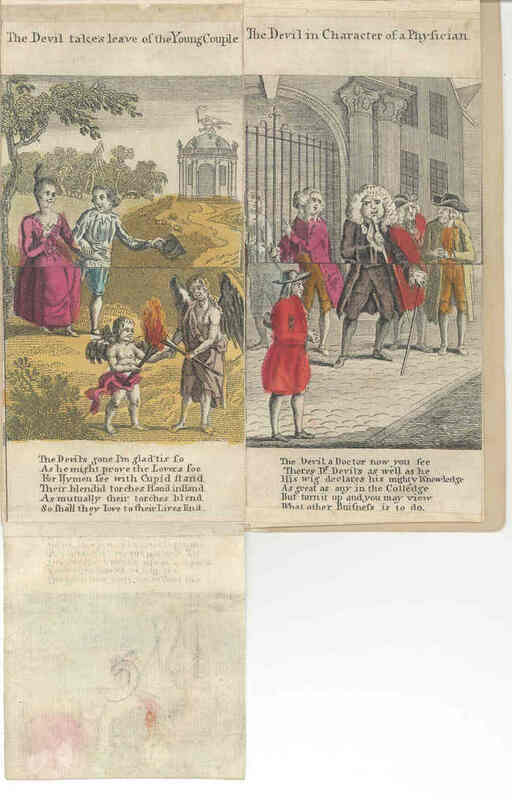 Mother Shipton London: Strutt, Burns, and Newbery, 1800. Paper Engineering: Fold, Pull, Pop & Turn. Washington, DC: The Smithsonian Libraries Exhibition Gallery, National Museum of American History, 2010. http://www.sil.si.edu/pdf/FPPT_brochure.pdf. Ball, James Moore. 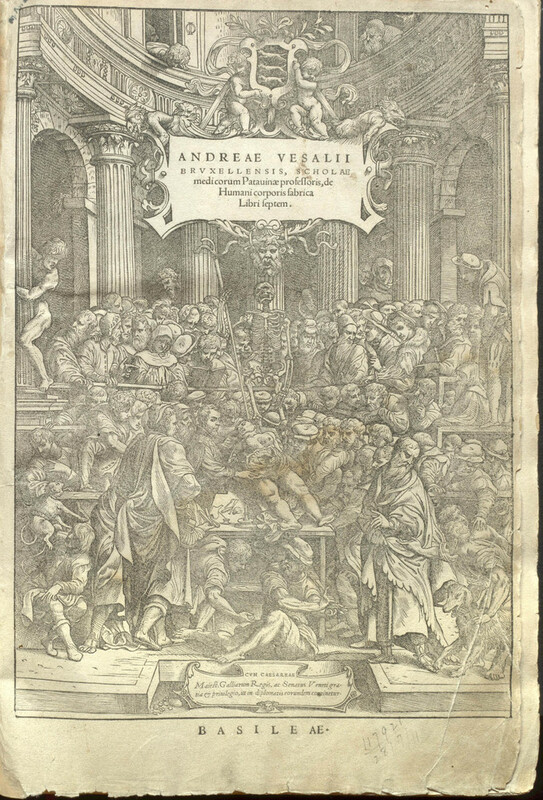 Andreas Vesalius, the Reformer of Anatomy. Saint Louis: Medical Science Press, 1910. Carlino, Andrea. Paper Bodies: A Catalogue of Anatomical Fugitive Sheets. Translated by Noga Arika. London: Wellcome Institute for the History of Medicine, 1999. Daniels, Stephen. 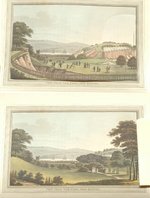 Humphry Repton: Landscape Gardening and the Geography of Georgian England. New Haven, CT: Yale University Press, 1999. Hotchkiss, Valerie, and Fred C. Robinson. English in Print: From Caxton to Shakespeare to Milton. Chicago, IL: University of Illinois Press, 2008. Karr Schmidt, Suzanne. Altered and Adorned: Using Renaissance Prints in Daily Life. New Haven, CT: Yale University Press, 2011. Montanaro, Ann. "A Concise History of Pop-up and Movable Books." Rutgers University Libraries. Accessed February 19, 2012. http://www.libraries.rutgers.edu/rul/libs/scua/montanar/p-intro.htm. Pettegree, Andrew. The Book in the Renaissance. New Haven, CT: Yale University Press, 2010. Pozeg, Zlatko I. and Eugene S. Flamm. "Vesalius and the 1543 Epitome of his De humani corporis Fabrica librorum: A Uniquely Illuminated Copy." Papers of the Bibliographical Society of America 103.2 (2009): 199-220. Repton, Humphry. Observations On the Theory and Practice of Landscape Gardening. 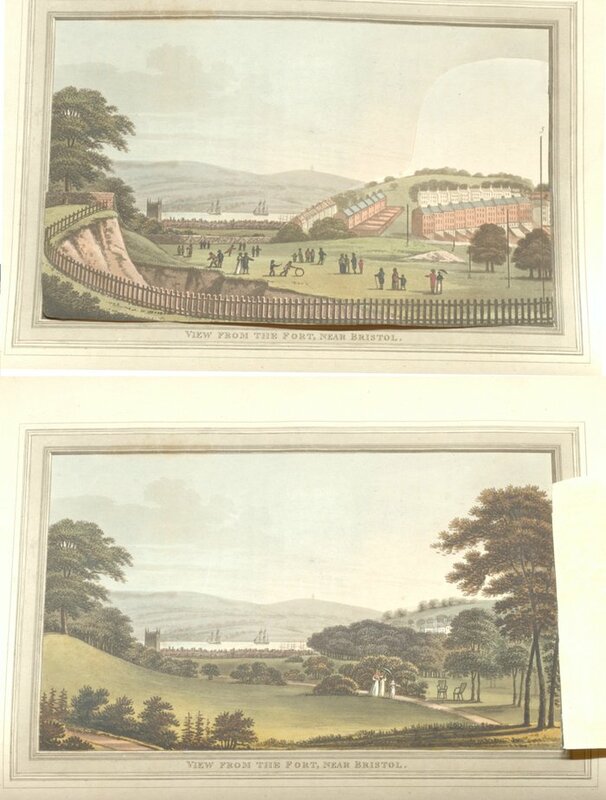 London: Printed for Taylor, 1803. Rubin, Ellen G.K. "Pop-up and Movable Books in the Context of History." The Pop-Up Lady. Last modified January 27, 2011. http://www.popuplady.com/about01-history.shtml. Slights, William W. E. The Heart in the Age of Shakespeare. Cambridge: Cambridge University Press, 2008. Speaight, George. "Harlequinade Turn-Ups." Theatre Notebook 45.2 (1991): 70-84. Wilkin, Rebecca M. "Figuring the Dead Descartes: Claude Clerselier's Homme De Rene Descartes (1664)." Representations 83.1 (2003): 38-66.